Rain boots with a little attitude. These kids boots are waterproof with white laces and printed stitching for added detail. Adorable on any kid, any age. EASY ON & OFF |Two pull handles on either side of the boot makes these easy on and easy off so the kid's can do it on their own. No moms needed! MOISTURE-OBSORBENT LINING | Extra soft cloth lining helps to keep feet warm and also helps to reduce odor. STYLISH DESIGN | These boots are designed to be both stylish and functional. 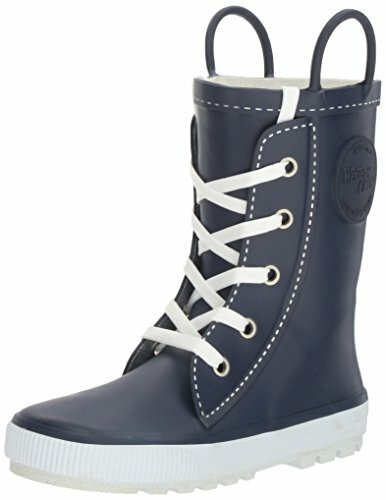 Wear these on a long walk in the rain or for class time, they can go anywhere and pair well with most outfits! EXTRA CUSHION FOR COMFORT | Plush cushioned footbed means these boots will keep feet extra and comfortable for long hours of play outside. Perfect Height for the kids, about 7" height. If you have any questions about this product by Western Chief, contact us by completing and submitting the form below. If you are looking for a specif part number, please include it with your message.